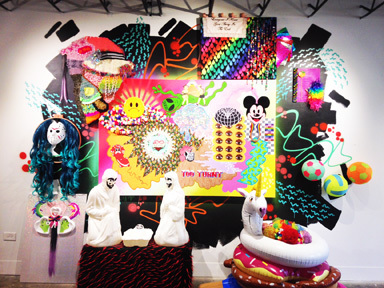 Somewhere over the Rainbow is Another Rainbow at Hatch Hamtramck is Shaina Kasztelan’s poison pen love letter to kitsch and consumerism. This Detroit artist and recent CCS grad seems to simultaneously love and hate the symbols and materials that she uses to create her wildly entertaining installations, paintings and sculptures. Many artists in Detroit are enthusiastic collagists of gritty urban substance, their artworks depending on the inherent material integrity of the parts to lend credibility to the whole. In contrast, Kasztelan employs the same assemblage method but uses materials that are the antithesis of authenticity. They are, in fact, intentionally notable for their fakeness. The color is super-sweet, the forms mass market. 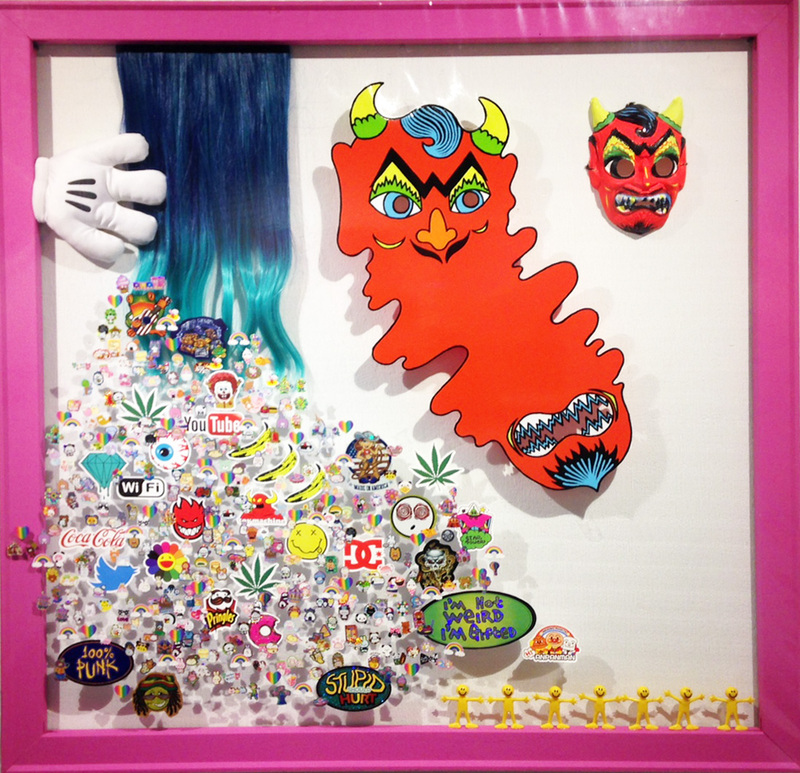 She combines polyester fur, hobby shop jewels, plastic inflatables and synthetic hair in obsessive aggregations, reaching new heights of over-saturated, over-the-top visual hysteria. I was surprised to learn that this is Kasztelan’s first solo show. The work seems confident, the installation expert. The friendly yet knowing mood of the exhibit reminds me most of John Waters’s movies with their gleeful embrace of low-brow mass culture and transgressive imagery. Kasztelan seems especially at ease in three dimensions. The most assured and ambitious work in the show, entitled The Alien with the Drake Tattoo/Dedicated to the Butterfly, is a kind of altar (complete with Juggalo nativity) that seems to burst out of a black cloud (of depression?) She seems less at ease in the conventional rectangular format of her paintings, which felt a bit awkward to me. But she has very cleverly circumvented this unease in The Devil’s Vibrating Smile by applying the imagery to clear vinyl. 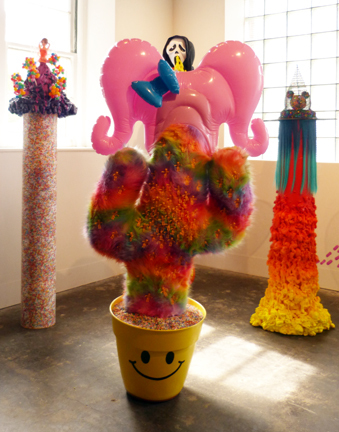 My favorite piece was a fake fur potted plant infested with tiny toy babies and topped by a pink plastic bouffant, entitled Baby Cactus is Happy. This show made me happy too. Somewhere over the Rainbow is a Double Rainbow is at Hatch Hamtramck until May 28. For more information for hours and events go here.